IWICS PARROT product line is a wireless mobile broadband system where the subscriber devices relay packets serving as part of the network infrastructure. Powered by patented Opportunity Driven Multiple Access™ (ODMA™) technology, PARROT units are characterized by high system capacity, easy installation, very low power consumption, high mobility and 4G-like bandwidth. The intelligent dynamic mesh architecture makes PARROT wireless relay systems a truly reliable metropolitan wireless backbone for delivering mobile data, voice and video services. The PARROT designation is an acronym derived from Programmable Adaptive Repeater/Relay Revert Back Onward/Opportunity Transmission. 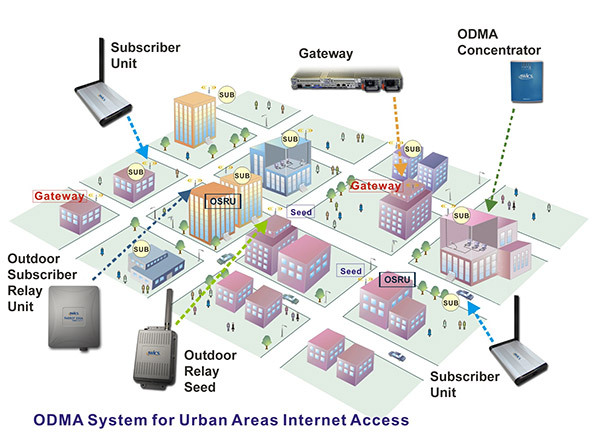 The PARROT product line supports IWICS WIDENET™ ODMA service networks. With WIDENET, service providers enjoy the simplicity of a plug-and-play ODMA network. Parties interested in learning about the benefits of becoming a WIDENET ODMA Network Service Provider or discovering more about our products can contact IWICS at sales@iwics.com.